An On-Site Presentation of Invisible Prehistoric Landscapes. Unger and Kvetina. Internet Archaeol. 43. The aim of this article is to demonstrate the opportunities for virtual and augmented presentation of prehistoric sites in situ where there is neither preserved construction nor any relics of the original landscape. Such sites usually meet with indifference both from the general public and institutions that are involved in the preservation of historic monuments. Both virtual reality (VR) and augmented reality (AR) have proven to be tools that have the potential both to grasp the invisible and to describe what has disappeared. Based on the examples of the Neolithic sites at Bylany near Kutna Hora and Prague-Vinor and at the Bronze Age site at Zalezlice in the Czech Republic, we have demonstrated the potential for digital heritage management. 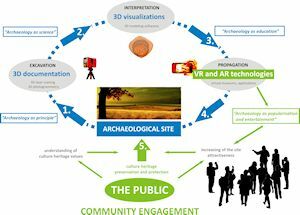 Such terms as 'virtual' or 'augmented reality' no longer refer to a million light-years away science-fiction concepts, but instead define a new tool for public archaeology and this article discusses its utilisation for in situ presentation of archaeological sites. The very rapid development of information technology, internet access and the overwhelming scale of the adoption of computer technology in recent years have enabled developments in how archaeological features are presented and reconstructed (Kvetina et al. 2015). However, on-site virtual presentation has very demanding requirements and possible solutions still need to take into account technical limits. During the last decade several systems and frameworks have been developed and tested to present 3D reconstructions of archaeological objects directly on-site through the application of virtual and augmented reality. So far, the AR applications that have been introduced use two basic techniques, overlapping digital and real data technology. The first and most widely used method is referred to as a marker-based method (Figure 1), whereby the virtual data are linked to two-dimensional images or in some cases three-dimensional objects (Kvetina et al. 2015, 13-14). The second method works without utilising these auxiliary markers, instead using optical tracking to place data in the virtual environment, i.e. the use of specific recognisable landmarks that are associated with a certain location. A set of reference images is selected for every point with AR, and live video is captured and compared to all the reference images in a database for the associated location, and when a match is detected the desired virtual visualisations will appear on the display (Zarzycki 2015). The first pioneering project was Archeoguide, which in 2005 tried to develop an Augmented Reality system that would enable visitors to view a computer-generated reconstruction of ancient Olympia without cutting them off from the real surroundings of the site (Vlahakis et al. 2001). Visitors were provided with a portable computer with sufficient hard-disk space, linked to a close-view head-mounted display, an additional mounted camera and other peripheral devices such as a GPS receiver or a digital compass for orientation and positioning and an image-based tracking system. Another initial attempt related to the ancient Roman city of Pompeii, where the Lifeplus project used AR to bring scenes from old frescoes back to life (Wolfenstetter 2007). Both projects used a hybrid-tracking module involving DGPS, a compass and video tracking the exact positioning and orientation of the 3D reconstructions, and animations displayed in AR were achieved. The exact optical position tracking without markers was accomplished by comparing the reference images that had been loaded from the central server with the GPS and the compass data (Wolfenstetter 2007, 13). These early mobile systems required the user to wear an entire set of hardware devices including cameras, electronic compasses and small laptops, which made the whole system uncomfortable and difficult to share with the wider public. The new and widely expanded range of portable devices with high-quality sensors including GPS, a compass, an accelerometer and a gyroscope, opens up a whole new range of options for presenting archaeological data and they are well suited for the augmented reality systems. Nevertheless, the most recent research projects that offer several mobile solutions are still unable to visualise outdoor AR 3D models fully (Murru et al. 2013). Markerless optical camera-tracking is a complex task, so for real-time application it is abrupt and unpredictable. There are other problems with the tracking system, leading to issues with positioning and the direction of the view (Noh et al. 2009, 53), while none of the available systems are appropriate for outdoor use without the adequate precision that Archeoguide had, thanks to its specific instrumentation. A project that used AR tracking to visualise the Middle Stoa in the ancient agora of Athens used a Sony VAIO Tap 11 tablet PC with a camera; the authors noticed that the application would need to be improved in terms of speed for rendering huge and detailed 3D models (Verykokou et al. 2014). The remaining obstacles include limited computational performance for optical tracking and the inaccuracy of the GPS in mobile devices, which can be metres out. This may not matter for applications that provide data overlays of supplementary information for physical objects that are perfectly visible with the naked eye, but for placing archaeological/historical buildings in their surroundings, it has a significant impact. One solution would be to make use of the simpler AR marker-based methods; however, at most cultural heritage sites the installation of artificial optical markers is absolutely impossible, which makes landmark tracking the only possible option available (Wolfenstetter 2007, 9). In fact most of the tracking systems that have been used to serve AR must be hybrid systems (Gao 2008), combining the advantages of several technologies (Wifi spots, eBeacons etc.). In the 4D virtual heritage projects that have been implemented so far with visualised tempo-spatial information directly at archaeological sites, we can see different solutions for how to tackle these difficulties. For the visualisation of 3D reconstructions in the urban environment, where the focus on the accurate location of these virtual objects is essential, the TimeWarp mobile application project in Cologne in Germany has been used to show the former Roman and medieval buildings, mostly only in open areas (Herbst et al. 2008). The Re-yuanmingyuan available on the iOS platform provides a virtual tour of the Imperial Garden of Yuanmingyuan from 1707 to 1860, using GPS for the visitors' basic orientation and QR codes to notify visitors about interesting spots. After reading the code the application brings up information including virtual reconstruction images and audio interpretation (Gongli et al. 2013). 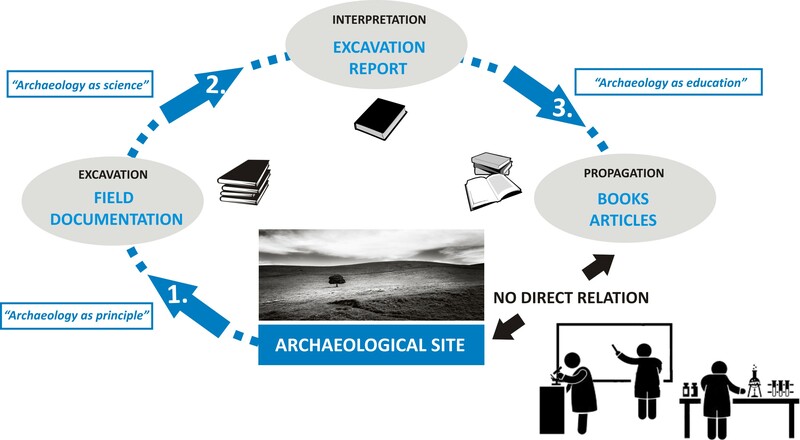 Other applications place simpler 2D content into the real environment (Streetmuseum, CultureClick), or they are restricted to only providing electronic information about the removed artefacts and their history in the context directly at the point of interest (ArchaeoApp) (Attila and Edit 2012; Holzinger et al. 2012). Even more problematic for augmented reality are the technically limited visualisations of 3D reconstructions on most of the archaeological sites that relate to Central European prehistory. The absence of visible archaeological evidence in the landscape leaves most visitors standing in the middle of a flat open field; this obliged us to develop a better solution. An important aspect in deciding how to implement an on-site presentation for mobile devices was the public access to available technology, and therefore the emphasis was put on the smallest data size of applications as possible and Android was chosen as the preferred operating systems. Last, but not least, cost was also taken into consideration, whereby we tried to use applications with affordable programming costs for smaller-scale heritage institutions. Due to the limitations of existing commercial mobile applications to interactively blend 3D content with the observed real world, we decided to adopt the principles of virtual reality for an on-site presentation of Bylany near Kutná Hora. There is no doubt that for bringing the archaeological sites back to life, AR through the combination of virtual elements with the real world, is more suitable, whereas in VR, the experience is predicated on the participant entering an entirely virtual world to the exclusion of reality (Eve 2012). Our application does not use a camera and only requires the user to stand in a known position and ensure alignment based on the device's gyroscope and compass, without any actual tracking and/or registration of the video feed with the virtual objects, as is the case in augmented reality (Murru et al. 2013). 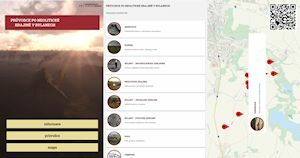 This application encompasses a total of nine stops that are located in the extended surroundings of Bylany to capture the main features and the settlement components of the Neolithic landscape. The application enables visitors using the map to navigate themselves between stops while the current position of the visitor is also highlighted, and to obtain basic text and visual information about each point of interest. All the 3D reconstructions that are displayed are based on archaeological evidence from almost half a century of archaeological research that has taken place in Bylany since the 1950s. Based on the data obtained by means of aerial laser scanning, the selected landscape section was subsequently modelled, with particular features being geo-referenced and exactly positioned where the original constructions stood. Visitors have the opportunity to see displayed on their own device the different phases of the Bylany Neolithic settlement's evolution including the nearby Neolithic circle enclosure (i.e. a rondel) and the Miskovice burial site, all incorporated with the character of the cultural landscape at that time. 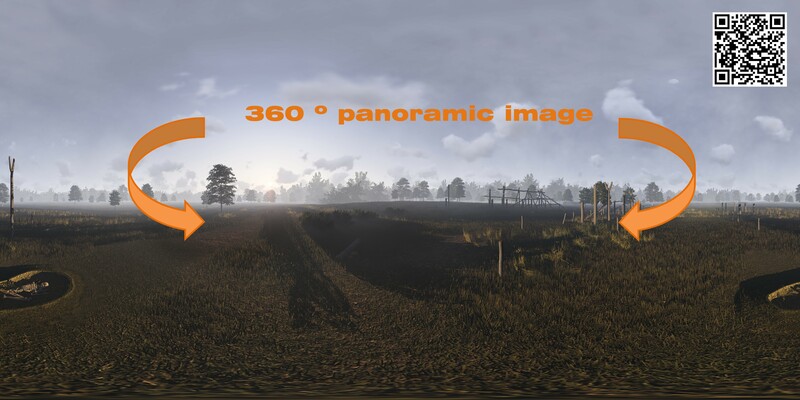 In order to facilitate the visitor's opportunity to better understand and experience the 3D reconstruction at the prehistoric site, the above-mentioned principle of virtual reality, combined with the gyro mode function, was used for this part of the application. 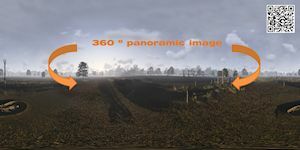 After implementing this feature of the application at a predefined location it is possible to 'set foot' directly in the centre of this Neolithic village and, by moving the device sideways, obtain a 360 degree view (Figure 3). This results in combining the virtual world, comprising 3D reconstructions of Neolithic dwellings, with the real world, since the contemporary landscape has been incorporated in the model. To improve the visitors' experience of the heritage site, the marker-based method was also utilised for 3D scans of artefacts directly from the site that were acquired for the purpose of a Web-based Virtual Museum (a collection of more than 900 artefacts in 3D is available at http://www.archaeo3d.com) and 3D photogrammetric models, excavated during rescue archaeological research. Therefore the information panels were set up next to the Institute of Archaeology's field base, including two markers enabling an AR visualisation of a full-size Neolithic burial, and a 3D model of a vessel that was found in Miskovice (Figure 4). 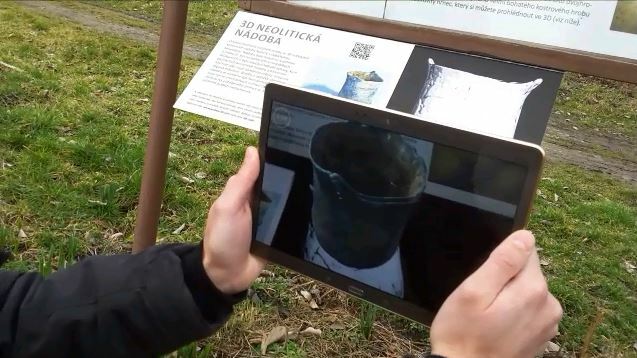 Another virtual open-air museum was put into use in Prague Vinor, where, in 2014, a rescue excavation uncovered parts of a Neolithic settlement, including the remains of two longhouses. The excavation results, including plans and geodetic localisation, were used to produce an ideal 3D reconstruction of the village and its vicinity. The application works analogously – the attached map highlights the points in the newly built-up area where users should initiate the specific virtual views in order to preserve the spatial context. Each of these 360 degree panoramic views captures a different part of the Neolithic settlement. By clicking on the points on the displayed 3D reconstruction that are marked, information boxes will pop-up and provide explanations of the different features or show images of sample artefacts that can be found locally. One of these views takes the user to a photogrammetrically recorded excavation site, enabling an explanation both of the rescue excavation process and the manner of the detection of archaeological features. Another application was based on 3D photogrammetry, which was conducted throughout the rescue excavation of a Late Bronze Age settlement in Zalezlice near Melnik, that subsequently enabled the creation of 3D models of all the inhumation burials unearthed in the settlement pits. The augmented reality application that was devised for their presentation uses the marker principle previously discussed. At present, leisure shelters with inbuilt large markers and information panels are being constructed along a popular cycling route that runs just next to the site; this will enable full-sized AR visualisations of the archaeological objects. We mention this application not because it is innovative but as a guide for other heritage institutions interested in the possibility of easily and inexpensively presenting rescue archaeology research results. The positive aspect of using this method of multi-image photogrammetry for the documentation of the immovable features that are uncovered during archaeological excavations, is its modest financial costs, without any necessity to use expensive equipment or hire trained personnel and, in particular, the ease and the rapidity of the acquisition of the necessary data. It is therefore possible to simply obtain the 'content' for the future applications that can automatically be used to generate marker-based AR applications (e.g. Layar, IN2AR, DWARF, DroidAR, PanicAR – see Kounavis et al. 2012). In general the problem with on-site presentation and heritage management of prehistoric sites are their standard preservation pattern. Most of the information concerning the imagery of the culture of the ancient Central-European inhabitants comes from excavated pits. In terms of simplified typology we can discern small, large and extremely large pits; nothing else. No standing houses, shrines, defensive walls or other structures are preserved. This represents a real challenge, both in terms of its presentation and in overall public awareness concerning the necessity to preserve these archaeological monuments. We have dedicated our work to the issue of public visibility and the presentation of Central European prehistoric sites. This directly relates to the lack of public awareness of the tangible unwritten evidence about this period of human history, either in the form of movable or immovable objects (landscape sites). We are sugggesting that one of the current options for how to begin to address heritage management is through the utilisation of mobile applications. The mass adoption of smart phones has introduced a whole new range of options for presenting archaeological data. The combination of the real and the virtual worlds, easily accessible through the telephone's display, allows us to leave the PC monitor behind, and presents a unique opportunity to enjoy the knowledge retrievable at archaeological sites directly in the field (Gongli et al. 2013; Noh et al. 2009; Eve 2012). We aimed to demonstrate that it is possible to implement a simple virtualisation of even those archaeological sites where the hard work was carried out many years ago, at a time when there was no option to select and collect the appropriate data. This is certainly a positive conclusion as it means that it is possible to at least partially process and present such sites, the importance of which has been obvious to the archaeological community for several decades, but not to most of the rest of the population. It is even more important, during the current implementation of archaeological research, to make use of the options provided by virtual archaeology, where it is possible, directly in the field, to utilise free or low-cost and easy handled 3D tools (such as 3D photogrammetry; see Campana and Remondino 2008) to instantly acquire a database of information that can later be used for the overall transformation of the data into a virtual environment. 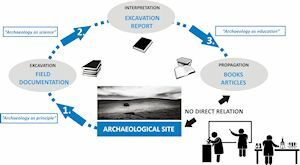 Adherence to these principles, also within the context of rescue excavations, the results of which usually end up only as reports found in the archives of the relevant institutions, will enable their quick and easy presentation to the public through virtual space. We hope that in turn this will raise the incentives for rescue excavations to another level. The overall purpose of this project was to focus on public archaeology. One of the challenges of this is that cognition of the oldest, even pre-literary, history of human culture remains within closed professional academic and heritage management circles. Therefore no direct relationship exists between the sites and either the general public or the local community. Thus any effort to provide virtual access to this type of site represents an alternative and desirable approach. It would provide an easy and enjoyable way to obtain information and experience the local genius loci (Fritz et al. 2005; Kounavis et al. 2012). It will also help to break down the barriers between the non-professional public and archaeology as either a science or one of the humanities. The goal is to engage the public and for this to lead to an understanding of the value of our cultural and historic heritage (Roussou 2002; Tan and Rahaman 2009; Rahaman and Tan 2011). Attila, K. and Edit, B. 2012 'Beyond reality – the possibilities of augmented reality in cultural and heritage tourism' in 2nd International Tourism and Sport Management Conference, Debrecen. 120-25. Campana, S. and Remondino, F. 2008 'Fast and detailed digital documentation of archaeological excavations and heritage artifacts' in A. Posluschny, K. Lambers and I. Herzog (eds) Layers of Perception. Proceedings of the 35th International Conference on Computer Applications and Quantitative Methods in Archaeology (CAA), Berlin, Germany, April 2–6, 2007, Bonn: Dr. Rudolf Habelt GmbH. 36–42. Fritz, F., Susperegui, A. and Linaza, M.T. 2005 'Enhancing cultural tourism experiences with augmented reality technologies' in M. Mudge, N. Ryan and R. Scopigno (eds) VAST 2005: The 6th International Symposium on Virtual Reality, Archaeology and Cultural Heritage, Pisa, Italy. The Eurographics Association. 8-11. Gongli, L., Shang, J. and Chen, H. 2013 'A mobile application for virtual heritage and ugc public sharing', ISPRS Annals of the Photogrammetry, Remote Sensing and Spatial Information Sciences Volume II-5/W1, 187-90. Herbst, I., Braun, A., McCall, R. and Broll, W. 2008 'TimeWarp: interactive time travel with a mobile mixed reality game' in MobileHCI '08 Proceedings of the 10th international conference on Human computer interaction with mobile devices and services, New York. 235-44. Holzinger, K., Koiner-Erath, G., Kosec, P., Fassold, M. and Holzinger, A. 2012 'ArchaeoApp Rome edition (AARE): making invisible sites visible-e-business aspects of historic knowledge discovery via mobile devices', DCNET/ICE-B/OPTICS, 115-22. Kounavis, C.D., Kasimati, A.E. and Zamani, E.D. 2012 'Enhancing the tourism experience through mobile augmented reality: Challenges and prospects', International Journal of Engineering Business Management, Special Issue Digital and Mobile Economy 10, 1–6. Kvetina, P., Unger, J. and Vavrecka, P. 2015 'Presenting the invisible and unfathomable: Virtual museum and augmented reality of the Neolithic site in Bylany, Czech republic', Archeologicke rozhledy 67, 3-22. Murru, G., Fratarcangeli, M. and Empler, T. 2013 'Practical augmented visualization on handheld devices for cultural heritage' in V. Skála (ed) WSCG 2013: communication papers proceedings: 21st International Conference in Central Europe on Computer Graphics, Visualization and Computer Vision in co-operation with EUROGRAPHICS Association, Plzeň: UNION Agency 97–103. Noh, Z., Sunar, M.S. and Pan, Z. 2009 'A review on augmented reality for virtual heritage system' in M. Chang, R. Kuo, D. Kinshuk, G.-D. Chen and M. Hirose (eds) Learning by Playing. Game-based Education System Design and Development, Berlin/Heidelberg: Springer. 50–61. Roussou, M. 2002 'Virtual heritage: from the research lab to the broad public' in F. Niccolucci (ed) Virtual Archaeology. Proceedings of the VAST Euroconference, Arezzo 2000, British Archaeological Reports International Series 1075, Oxford: Archaeopress. 93–100. Tan, B.K. and Rahaman, H. 2009 'Virtual heritage: reality and criticism' in T. Tidafi and T. Dorta (eds) Joining Languages, Cultures and Visions/Joindre Langages, Cultures et Visions. Proceedings of the 13th International CAAD Futures Conference, Montréal: Les Presses de l'Université de Montréal. 143–56. Verykokou, S., Charalabos, I. and Georgia, K. 2014 '3D Visualization via augmented reality: the case of the middle stoa in the ancient agora of Athens' in M. Ioannides, N. Thalmann, E. Fink, R. Žarnić, A. Yen and E. Quak (eds) Digital Heritage. Progress in Cultural Heritage: Documentation, Preservation, and Protection, Volume 8740 of the series Lecture Notes in Computer Science. 279-89. Vlahakis, V., Karigiannis, J., Tsotros, M., Gounaris, M., Almeida, L., Stricker, D., Gleue, T., Christou, I., Carlucci, R. and Ioannidis, N. 2001 'ARCHEOGUIDE: first results of an augmented reality, mobile computing system in cultural heritage sites' in Proceedings of Virtual Reality, Archaeology, and Cultural Heritage International Symposium (VAST01), Glyfada, Nr Athens, Greece. 131-40. Wolfenstetter, T. 2007 Applications of Augmented Reality Technology for Archaeological Purposes, Technische Universitat Munchen, Tech. Rep.